As an industry leader in unsupervised machine learning, DataVisor offers cutting-edge security to some of the largest financial and internet properties in the world. But like any compute-heavy workload in the cloud, their machine learning loads required careful management to avoid over-spending – leading to the need for increased cloud visibility. 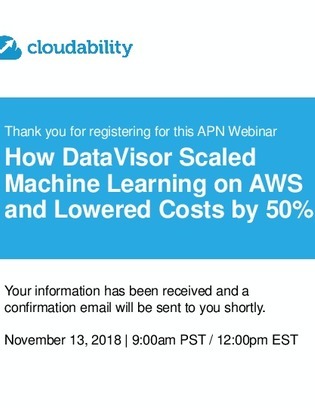 Tune in on November 13th at 9am PST/12pm EST to hear from AWS and DataVisor team members and get an inside look into how DataVisor was able to increase cloud visibility and reduce spend in AWS by 50% -- giving their machine learning operations an edge on the competition.